We did our first gastric sleeve surgeries in Thailand 8 years ago. Since then our competence of these surgeries have increased and today we have our own gastric sleeve center in Bangkok. Gastric sleeve is a modern weight loss surgery and sometimes life saving surgery for our clients who have fought with obesity for years. Having your gastric sleeve surgery in Thailand you will enjoy Thai hospitality when admitted in the beautiful hospital and in the recuperation apartment. Gastric Sleeve or sleeve gastrectomy surgery is a surgical procedure to reduce the size of your stomach, so you feel full faster and you are limited to how much you can eat. You can expect to lose between 50-60% of your excess weight with a gastric sleeve surgery. 170cm tall, 125 kgs BMI 43.3 in this example the excess weight is 60 kgs, hence the expected weight loss from gastric sleeve is 30 kgs or more. 160 cm tall, 100 kgs BMI 39.1 in this example the excess weight is 43 kgs, hence the expected weight loss from the sleeve surgery is around 22 kgs. 180 cm tall, 160 kgs BMI 49.4 in this example the excess weight is 87 kgs, hence the expected weight loss from the gastric sleeve surgery is around 44 kgs. 155 cm tall, 90 kgs BMI 37.5, in this example the excess weight is 36 kgs, hence the expected weight loss from gastric sleeve is around 18 kgs and up. The above examples are indicative of the weight loss that can be expected. Weight loss will vary from client to client. 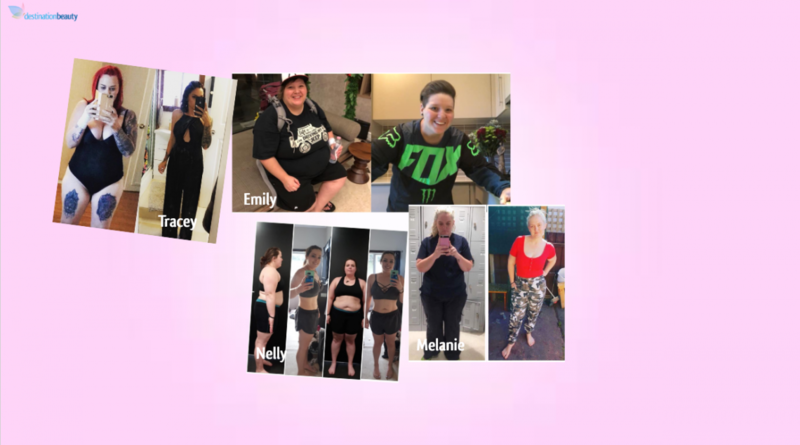 Meet Emily and Paula, they both had a gastric sleeve to help them lose weight. 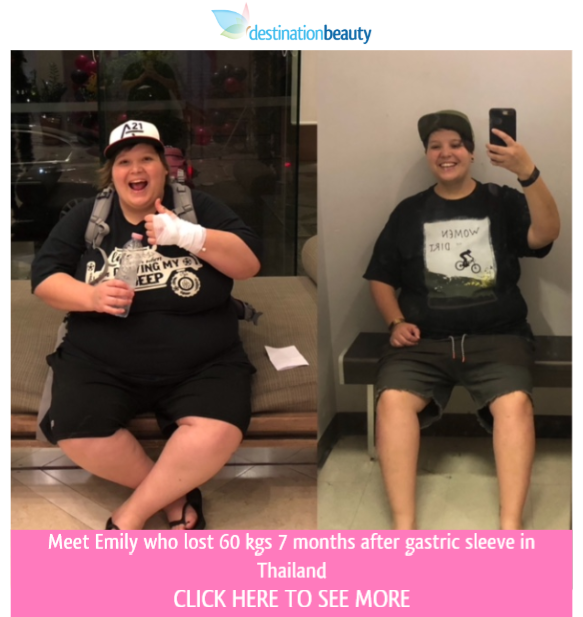 Emily weighed 164.5 kgs and lost 56 kgs 6 months after gastric sleeve in Thailand. Paula lost 47 kgs 8 months after gastric sleeve surgery in Thailand. Watch Emily’s gastric sleeve surgery in Thailand! Watch Paula’s gastric sleeve surgery in Thailand! The gastric sleeve surgery is a keyhole surgery using laparoscopic equipment. It means a few small incisions are made, and the doctor uses camera technique to carry out the surgery. The gastric sleeve surgery takes around 2 hours to perform. You will be admitted to the hospital for 5 nights, and you will consult with a doctor to advice you on future diet. The laparoscopic Surgeon is Dr. Narong, an experienced surgeon specialised in Gastric Sleeve surgery. Dr. Narong is the head of Klang Hospital, Bangkok Obesity Clinic, a clinic he has setup at the Thai public hospital. Dr. Narong is also the head gastric sleeve surgeon at Samitivej Thonburi Hospital. We recommend you discuss with your GP about having a gastric sleeve. You may also be required to have a sleep test to see if you are suffering from sleep apnea. 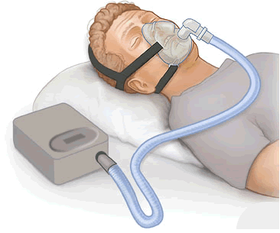 If you have sleep apnea (sleep apnea is when you stop breathing for a period during sleep) you will be required to bring your own CPAP machine to Thailand and to have used it for minimum 2 weeks prior to surgery. Do I need to complete a sleep study ? 1) Do you snore loudly? 2) Do you feel tired, fatigued or sleepy during the day ? 3) Have you been told you stop breathing during your sleep ? 4) Do you have high blood pressure or are treated for high blood pressure ? 5) Is your body mass index greater than 35 ? 6) Are you 50 years old or older? 7) Are you a male with neck circumference greater than 17 inches (42.5 cm), or a female with neck circumference greater than 16 inches (40 cm)? 8) Are you a male? The sleep study will decide if you require a use a CPAP before surgery. Below you can see a CPAP machine illustrated. The machine applied a mild pressure to keep the airways open and ensure you receive enough oxygen during your sleep. Please contact us via email info@destinationbeauty.com or FILL IN THE EVALUATION FORM CLICK HERE! It all starts with you contacting Destination Beauty and filling in the evaluation form: FILL IN THE EVALUATION FORM CLICK HERE! We will then discuss with Dr. Narong if you are a good candidate for gastric sleeve surgery, assuming you are a good candidate we will confirm you are a good candidate and email you a quote as well. You can then make a booking for surgery. You will need to spend around 2 weeks in Thailand, during that period you will be admitted 5 nights in the hospital. Most clients will be requested to complete a sleep study before having surgery. This is to determine is you have sleep apnea (sleep apnea is when you stop breathing for a period in your sleep). Clients with sleep apnea will need to use CPAP machine for minimum 14 nights before coming over for surgery. The CPAP machine help you breath when you are sleeping. When you come to Thailand our driver will pick you up at the airport and send you to the luxury apartments where many of our clients stay. You will relax the first night at the hotel. The next morning we will pick you up and drive you to the hospital where the pre operative checks will be begin. You will do a standard pre-surgery checkup and you will also have a gastroscope tests to see if you stomach is infected before surgery. You will typically meet a gastro intestinal doctor, a dietrician/endocrine doctor and of course you will consult with Dr. Narong our gastric sleeve surgeon. After spending 2-3 nights in the serviced apartment you will be admitted to the hospital where you will have surgery. Admission is typically for 5 nights. The first night after surgery is usually spent in the intensive care unit. You will then transfer to the ward where you will spend the remaining 4 nights. You will likely be out of the bed on the day after surgery or maybe even the same day. Dr. Narong and our dietician will check up on your while in hospital. After spending 5 nights in hospital you will be picked up and sent back to the serviced apartment again. you will have a few more checkups while at the serviced apartment (we will pick you up and send you to and from the hospital. While staying at the serviced apartment you will meet with our clients who had gastric sleeve or plastic surgery and you can join our afternoon tea activities every Tuesday and Thursday. You will also be offered nurse visits to you apartment every Monday, Wednesday and Friday. You should have a good understanding of possible complications during and after your surgery. The most worrisome complication from gastric sleeve surgery is a staple line leak. Staple line leaks can occur during or after surgery. During surgery, they are typically noticed and fixed before completing the surgery – no big deal. However, if they go unnoticed, you will start to get sick shortly after surgery. Staple line leaks typically occur during the first month after surgery. They can be triggered by eating improper foods (always follow your post-op diet) or from the tissues of your stomach not healing. This, in turn, leads to the staples detaching from the thin, devascularized tissue which then leads to a leak. A staple line leak leads to a major infection as your stomach juices enter your abdomen. The signs and symptoms are tachycardia (rapid heartbeat), fever, chest pain, and pain in your belly. Most staple line leaks occur within 14 days of surgery. See your doctor immediately, if any of these symptoms are present. The risk of death from gastric sleeve surgery is low. You can stretch your stomach after gastric sleeve surgery. The inside of your stomach is lined with rugae. These are folds of tissue that expand and contract in relation to the amount of food that enters your stomach. When they expand, your stomach sends a signal to your brain that you are full. When they contract, they push the food into your intestines for further processing. Once the stomach is empty, a hormone called ghrelin is released that triggers hunger again. These signals can get skewed when your stomach is constantly stretched from too much food. Below are a few tips to reduce the risk of stretching your stomach. Drink water an hour before and an hour after you eat. This gives your body time to digest the food and make room for fluids and vice versa. Don’t eat and drink at the same time. Don’t drink carbonated beverages. The carbonation can put unneeded pressure on your stomach. Eat small, healthy snacks if you get hungry in-between meals. Plan your meals. Focus on small portions of nutrient dense foods. Nutrient dense foods keep you full longer and give you the nutrients that you need. Remember, if you overeat once, you haven’t ruined your new stomach. Get back on track as quickly as possible. It’s important to know that emotional changes do happen after surgery. And you should be prepared for them. Immediately after surgery, you will start to lose weight very quickly. Drastic weight loss leads to changes in hormone production, changing levels of estrogen and testosterone results in mood swings. On top of the mood swings, you will be tired. Tired and moody people tend to be less than pleasant. But this goes away. And not everyone experiences mood swings. Gastric sleeve surgery doesn’t require regular band fills like the Lap Band does. But it does require maintenance. There are no tune-ups with a gastric sleeve. Once it’s done, it’s done. However, you do have to ensure you are doing the right things to create lasting weight loss. It’s utterly important that you follow the new diet guidelines for the rest of your life. Falling back into old habits is easy. You can regain weight after gastric sleeve surgery. You must ensure that you continue to work out at a minimum of 3 times per week. It’s preferable to workout 5 to 7 days a week for 30 minutes. Exercise can be walks, runs, fitness videos, etc. The goal is to get moving and increase your heart rate. In turn, you’ll burn calories. Maintaining a positive attitude 100% of the time is impossible. Everyone has bad days. For people with food addictions, a state of depression can trigger food cravings. When you’re depressed, food becomes comfort. Being healthy becomes secondary to finding immediate comfort. On a daily basis you should take notice of your mood. Are you motivated? Have you been spending time with friends? Are you abnormally tired? Losing the battle with food often starts with a sad or angry mood. Ensure you pay attention to your mood and actively manage it by implementing healthy activities to improve your well-being. While you will have bad days, don’t let those bad days become bad weeks or months. If you have a bad day and seek comfort from food, it’s ok. Tomorrow is a new day. Don’t let overeating become a vicious cycle that leads to a stretched stomach and weight gain. We meet up with Scot before Scot is going home to New Zealand after his Gastric Sleeve surgery in Thailand. Scot has lost 10 kgs after surgery, Scot was 202 kgs when he had the surgery. Michelle’s Experience with Gastric Sleeve – Massive Weight Loss from destinationbeauty.com on Vimeo. Read about Chanelle’s gastric sleeve surgery in Bangkok with Dr. Narong! See Tracey before and after 26 kgs weight loss after gastric sleeve surgery in Bangkok!